Fear not fellow Springfieldians – your analytical prayers have been answered. Some genius by the name of Todd W. Schneider has selflessly spent hours analysing The Simpsons, writing codes and doing all sorts of tricky tech wizardry so that the world can know the answers to all those big Simpsons questions you’ve been starting punch-ups over for years. 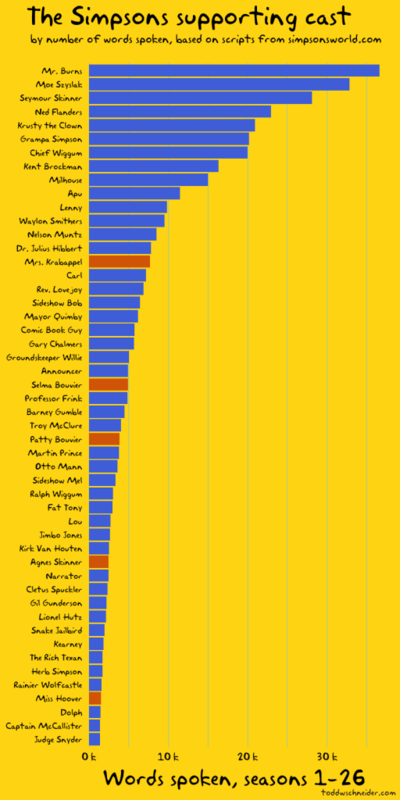 The data collected has allowed Schneider to rank the characters by the amount of dialogue they have, and determine where most of the show takes place. Maggie and Springfield Gorge are clear winner obviously *heavy sarcasm*. 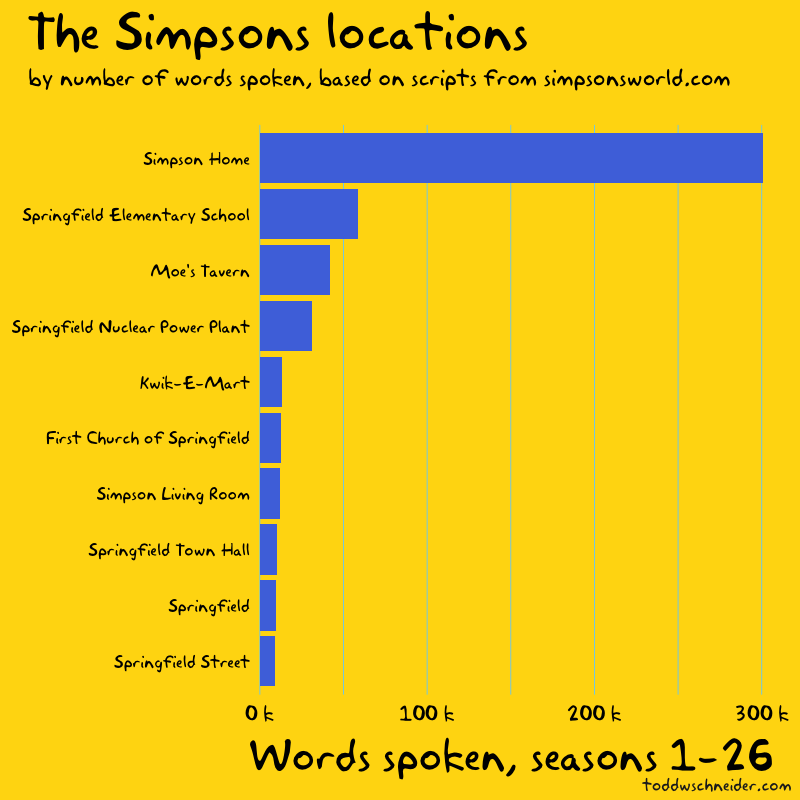 Unsurprisingly, the Simpson home is the most popular location, followed by Springfield Elementary. There were a few surprises over who the most talkative secondary characters are. Springfield’s favourite bad boy, Mr Burns, is the fifth most heard character after Homer, Marge, Bart and Lisa. 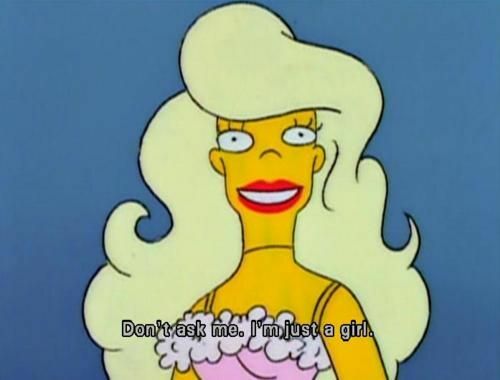 And in breaking news, Selma Bouvier seems to be slightly more chatty than her twin Patty. Who knew? Interestingly the data did proved is that there is a massive gender imbalance between the amount of male and female dialogue on the show. According to Schneider, only a quarter of all dialogue on the show is said by women, which drops to less than 10% when you eliminate Marge and Lisa. Still not impressed by Schneider’s analysis? Through the magic of coding, Schneider even managed to figure out the most common and important word or phrase in each episode, and renamed the episode to more easily determine its content. For example the first Treehouse of Horror has simply been renamed ‘nevermore’ and ‘In Marge We Trust’ has been changed to ‘Mr Sparkle’. What a world we live in. Here’s a new idea for a Simpsons quiz- state the new ‘Schneider’ name of the episode and try and guess the real one. Or vice-versa. Hours of fun. Thanks Schneider. We Simpsons fans owe you one.